The real story behind ex-gay ministries and reparative therapy! Nationally known activist Wayne Besen spent four years examining the phenomenon of ex-gay ministries and reparative therapiesinterviewing leaders, attending conferences, and visiting ministries undercover as he accumulated hundreds of hours of research. The result is Anything but Straight: Unmasking the Scandals and Lies Behind the Ex-Gay Myth, a groundbreaking exposé of the controversial movement that's revered by independent religious groups and reviled by gay and lesbian organizations. The book presents a historical perspective on the dispute, examining ex-gay groups such as Love In Action, Exodus International, Homosexuals Anonymous, and profiling a cast of characters that includes Pat Robertson, the Rev. Jerry Falwell, ex-gay poster boy John Paulk, National Association of Research and Therapy of Homosexuality activist Richard Cohen, and psychiatrist Dr. Robert Spitzer. From the author: Through my extensive experience, I have learned that the extraordinary claims made by the ex-gay groups are without merit and the efficacy of their programs is dubious at best and harmful at worst . . . One frequent question I get is, Why can't gay activists simply leave 'ex-gay' groups alone and let them go about their business? This is exactly what happened for nearly three decades while ex-gay groups labored in near anonymity. But all this recently changed when the ex-gay groups intricately aligned themselves with the anti-gay political agenda of the Religious Right. With ex-gays added to their arsenal, the Right could disingenuously claim to love gay people and offer them hope for change, while simultaneously fighting for punitive legislation. Their insidious message: Since gays and lesbians can change, there is no need for laws that protect them against arbitrary prejudice. 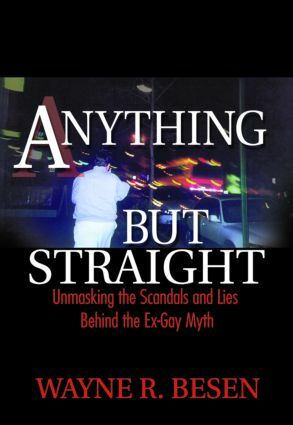 Anything but Straight: Unmasking the Scandals and Lies Behind the Ex-Gay Myth is an essential read for activists on both sides of the ex-gay fence, family members of gays and lesbians, Gay, Bisexual, Lesbian, and Transgender church members, psychiatric and social science professionals, and anyone who has dealt with coming out issues. An appendix of resources and a helpful bibliography make it easy to find additional information on this fascinating topic.